The days of any colour you want as long as it is black have gone. It is no longer only about optimising your production line to make the same things faster and cheaper. It is about designing your supply chain to meet the particular needs of the individual consumer or unique business. Businesses used to design products and processes around Personas, groups of people or businesses with similar needs and behaviors. With the advent of big data, this is no longer the case as we can now drill down to the unique needs of just one consumer or one business. 3D Printing provides the ability for companies to use all that information and all that digital knowledge to create a product or a series of products when they're needed and where they're needed. 3D Printing, therefore, could disrupt manufacturing, supply chain and in turn, stands to disrupt the balance of Global Trade. That is the magic that 3D Printing brings. Considering trade movements today, the re-writing of global trade agreements, the concerns about trade imbalances and the global movement of goods. 3D Printing provides the opportunity for delivering parts where they are needed when they are needed. 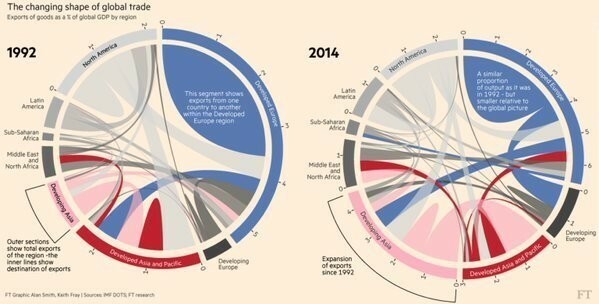 Bearing this in mind, what are the implications for global trade? What will the implications be for the logistics and the supply chain industries, the transfer of money and the way we presently do things? The implications of genuine localised print on demand production potentially can change almost every element of global trade and potentially change the global balance of power. So, what is 3D Printing? It's not only the fear mongering of the printing of guns and the heart-warming printing of prosthetic limbs that we see in the press. It is also far more than downloading comic characters and knick-knacks from Thingiverse or other online portals and printing them on your $399 consumer printer. 3D Printing is a lot more than that, but at the end of the day, it's nothing more than taking digital data and converting it into an analogue part. What we start off with is digital data. And that digital data can be derived in several ways. It can be designed by the manufacturer, it can be downloaded as content from a service provider, it can be obtained through surface scanning or medical scanning. That 3D digital information is then converted digitally into hundreds or thousands of layers, which are then sent to a machine which over time converts it into a physical product. This is the magic of 3D Printing. It is about the fact that companies can have a digital warehouse full of digital parts waiting to be ordered, then produced and delivered on demand where they are needed. This simple on-demand process has implications for the military. It has implications for consumer goods, for electronics goods and many more. Every single manufacturer or product will be and can be touched by this change in the conversion of digital to analogue on demand. There has been a lot of hype about 3D Printing. Does it live up to the hype? I would be wrong to pretend that we have not been through and suffered from a media and investor-driven hype. Six years ago, the front page of every paper was, "Everyone will have a 3D printer in their home and you will be printing your spare parts at home” This has not yet happened and may not happen for another 10 years, as the key missing element is content. Most consumers don't have the ability to generate content, but that missing consumer content is what makes manufacturers the owners of this 3D Printing delivery paradigm. Manufacturers control the success of this 3D Printing future because they control the content, but managing that content effectively determines whether 3D Printing will add value or not. 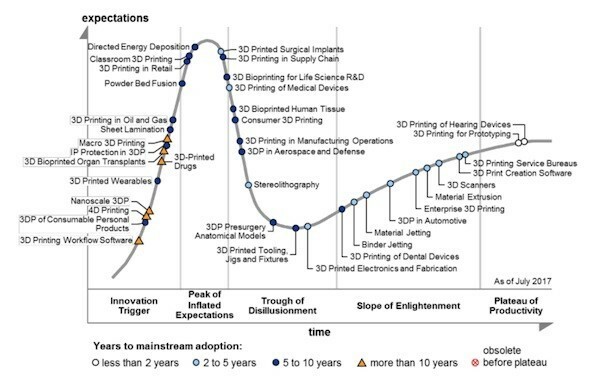 This is the great 3D Printing consumer hype of five or six years ago, and we're now as Gartner describes it, in the trough of disillusionment for Consumer 3D Printing. This disillusionment is driven by the lack of content and the limitations of consumer devices. Consider what iTunes did to the music industry. We made our mixtapes by recording off the radio or copying CDs or using LimeWire or other P2P protocols, until iTunes came along and made it really easy and said, "For 99 cents, you can download any song you want. Digitally, instantaneously." And in a very short time, the music industry changed forever. When the iTunes of the 3D Printing industry comes along, when the collaboration happens between a large vendor who works with Toyota and Volkswagen and Ford and Bosch and says, "Let's send all of those knobs and those buttons and those easily accessible products and let's make those available online for 99 cents per download." That will start to change the dynamic of, "Will someone print from home?" And then what are the implications for warehousing and for logistics and for your supply chain? Enterprise 3D Printing, on the other hand, is showing growth in leaps and bounds. Those of you who have seen 3D Printers may have noticed that compared to conventional high-speed production processes, 3D Printing is relatively slow. This results in many manufacturing organisations discounting 3D Printing preferring to wait until the technology starts to match traditional techniques for speed. A comment I have often heard is "Where's the magic of this? This takes forever. I can produce 300,000 widgets in the time it takes a 3D printer to produce 10 widgets.” The key differences are those 300,000 widgets are identical. The 10 widgets from a 3D printer, can each be unique. Every single one can be tailored or customised for a unique application, and they are only being produced when needed as the economies of scale in 3D Printing do not require high volume production to optimise cost. This means that manufacturers are in fact dramatically shortening the supply chain, changing the logistics pattern, changing the warehouse patterns and changing the way things get done. What are the implications of this on the balance of trade? What will it do to the way manufacturers manage their warehousing? What will it do to the way they manage their data and IP flow? How will they collect the correct information to ensure that they are producing the right item, in the right place, and using the right materials on the right device? Not every 3D printer is the same. They differ by application. They differ by material. They differ by output and performance. Therefore, when starting out on a 3D Printing journey it requires a very clear understanding of what your supply chain looks like, what your customer's expectations are, and where you get your information from to ensure that the correct devices and processes are selected. 3D Printing is not the Beta and VHS battles of 30 years ago with "one will win". There are seven core 3D Printing technologies from a large variety of manufacturers, and each of these has unique characteristics and unique strengths and weaknesses, and there's nothing yet that suggests there'll be one technology that will rule them all. Manufacturers will need to come to terms with different devices and different technologies to meet their complex demands for manufacturing products, but traditional manufacturing is no different. A traditional manufacturing environment consists of injection moulders, CNC machines, lathes, robots and a vast array of specialist equipment. In a traditional manufacturing environment and supply chain, we talk design, iteration, production, warehousing, shipping, warehousing and distribution to the customer. The 3D printed supply chain is potentially much shorter, more efficient and customer specific. In a 3D Printed Supply Chain, we shorten the design cycle, we optimise the iteration cycle, we enhance the production cycle producing unique products when needed, we remove the warehouse and we change the distribution channels. This requires in many cases a complete re-think of your business and a potentially more collaborative relationship with your consumer. In fact, your business model may change so dramatically that may you start to license your IP or Data, allowing your customer to produce the product on their site. In any industry, there are those who wait, and there are those who lead the way, and there are many companies who are not standing by and waiting. Gartner predicts that by 2021, 20% of the top 100 consumer goods companies will be 3D Printing end-use parts or products. Adidas is actively producing and selling 3D Printed shoes, this is not a laboratory concept it is a commercial product. The Head of Adidas global design said "Today, it's a statement. Tomorrow, it's for everyone." To go online today and buy your 3D printed pair of sneakers, you're paying a premium for it. As he says, “it's a statement”. You're doing it because it's cool and customized, but soon, everyone will be doing this. And then it will impact the complete supply chain. If you're not evaluating the impact of 3D printing on your supply chain now, you should begin! Now. Again, according to Gartner by 2021, 40% of manufacturing enterprises will establish Additive Manufacturing (3D Printing) centres of excellence. BMW, Siemens are excellent examples of companies starting Additive Manufacturing centres of excellence. The centres are to ensure that these companies have a thorough handle on the various technologies, applications, and processes, and this is driven by the fact that there is no one 3D Printing technology that will meet your needs, there is no one machine that will do everything, and to get the best out of 3D Printing there is no point replicating standard designs. This means that time, effort and money need to be applied to optimise your designs for 3D Printing, to select the right technologies for your product and to verify the processes that you will implement. Forget the fact that today 3D Printing looks slow. Think of it within the complete timeline and knowing that 3D Printing is getting faster every day. Stratasys has spun off a company called Evolve Additive that from 2019 will be launching a 3D Printer that they claim is 50 times faster than anything already in the market. Desktop Metal is introducing a metal 3D Printer that they say will print thousands of parts faster than any other metal 3D printer can. Dramatic changes are afoot, but too often manufacturers say, "3D Printing is too new, we will wait and see what happens, and then we’ll decide." But 3D Printing is not new. It's 30 years old. It's taken 30 years to get where it is today, and the development cycle for new iterations of 3D Printing reduces dramatically all the time. Machines are faster, materials are stronger, the surface finishes are better, the access to a range of materials is changing every single day. 3D Printing is about speed, customisation, distributed manufacturing, and supply chain consolidation. It's highly secure. It's highly automated. You can dedicate a part, a product to a machine in a location anywhere in the world. Your ERP system will recognize it needs to produce a part either based on specific demand, forecast or predicted the lifespan of a part physically in use based on real-time sensor feedback. The system will then pull the right design from digital inventory, will determine from the data in the file which devices have been approved for producing that part, with which material and with which specific build parameters. That part will then be securely transmitted to the device, it will be printed on site, and someone or something will remove that part from the printer, process it and install it. Let us consider the mining industry in Australia or anywhere else in the world for that matter. An hour of no production, no mining, is millions of dollars of lost revenue. If they implemented a process whereby they had verified, certified devices on the mine both metal and polymer 3D Printers, with IOT sensors on their tractors and diggers underground evaluating the loads, the stresses and the ages of all the parts. They would then be able to predict failure and be able to send that information via a secure ERP system to a digital warehouse which would then ensure that the correct part was produced where and when needed. Think of the implications to productivity and cost. The average car has 30,000 parts. 381 billion dollars’ worth of parts is stored around the world to sustain cars in the field. When a car no longer is viable or is taken off the market, what is done with those parts? How long should those parts be kept available? What if it didn't matter? If there was a digital supply chain, it wouldn't matter. Manufacturers would be able to meet needs immediately. We’d be able to keep these cars going longer at a lower cost with decentralised or globalised manufacturing. How can this be achieved? There’re several steps. The first one is the obvious step. Analyse what it is you're trying to achieve. Are you trying to achieve cost savings? Are you trying to improve the customer experience? Are you trying to improve your product? Determine what matters for your business and what those implications are, those values are. Then using that data, go back into your warehouse of parts and back into your warehouse of products and evaluate which products, which parts have the largest implications. Which ones are the ones that you want to sell first? Define the parameters of those parts. How strong does it need to be? What does the surface finish need to look like? What kind of materials does it need to be made from? How will it be used in the field? So far it is all normal business practice, but then we introduce DfAM, which is Design for Additive Manufacturing. If you take a standard part or design and 3D print it, you'll have a part that works, but you've also missed some of the magic of 3D Printing. 3D Printing is about what you can leave out, many parts in use today on airplanes, rockets, and cars aren't designed that way because it's the best design for the application, they are often designed that way because it is the only practical way to produce it. In traditional manufacturing, you always need to consider, "How do I eject that from a tool? How can I machine it effectively?" So, design for traditional manufacturing is often about "What can I get away with?" Or "What can't I get away with?" With a 3D design, we evaluate it differently. There's almost nothing we cannot produce. If you need a hole or a cavity in the centre of a solid, you can do it. If you need a complex organic shape because it happens to give you the best load to weight ratio, you can do it. A 3D printer repeatedly puts down thin two-dimensional layers. If it needs a hole, it “prints” a hole. It can make beautiful organic shapes without concern about access or eject-ability from a tool. Design for Additive Manufacturing means taking those parts you've selected and evaluating, "How can I change it to get the best out of Additive Manufacturing, and the best performance from the part?" 3D Printing also enables part consolidation. Often a part consists of multiple parts again due to manufacturing limitations, like an air intake for a rocket. They are often made of multiple parts, not because that's the best design, but because of access and machining and assembly, they must be made as separate elements and then post-assembled. That takes time and costs money, with 3D Printing, you can do complex geometry, complex shapes all in one go. Design for Additive Manufacturing is a crucial element that determines whether your 3D Printing journey will be successful or not. If you don't do this, your parts will fail. You won't get the best out of 3D Printing and you'll sit back and say, "What a load of rubbish." To get the best out of it, you've got to rethink that part design. Then you need to go through your qualification process, qualify the device, the material. 3D Printing means that parts should not be evaluated on a like-for-like basis. Just because you make a part today in aluminum, doesn't mean that if 3D printed it must be 3D printed in aluminum. You might find there's a complex polymer that suits it better. You might find that you've only been doing it in aluminum because that was the way you've always done it. But maybe 3D Printing in Carbon filled Nylon 12 would make far better sense. To make this process work qualify the part expectations, then qualify the device, because devices are not alike. Once you have a qualified device and a qualified part designed for Additive Manufacturing, you can start to implement digital warehousing. You can start to benefit from this digital supply chain or an intelligent supply chain. And then produce the part. Produce it where you want and where you need it. In summary, the magic of 3D Printing is, it doesn't need complex tooling or setup. It can produce batches of parts where every part is unique. It can produce complex geometries that are not possible with traditional manufacturing, meaning you can design better and smarter to get the best out of your design and your product. It can produce parts when needed and where needed. It reduces inventory and reduces the cost of obsolescence. It increases your ability to customise to satisfy your unique customer base. If Additive Manufacturing is not part of your supply chain journey now, if it is not in the conversation in your boardrooms or the conversation in your manufacturing teams, my question is why not? Because if you don't consider it now, you will be left behind when everyone else catches on. Studio System™ for rapid prototyping: Lumenium Virginia-based startup finds opportunity to reduce product development timeline by 25%. Injection molding firm investigates quick-turn mold application identifies 90% cost savings. Free ticket to CeBIT 2014!